Photo of the Week. 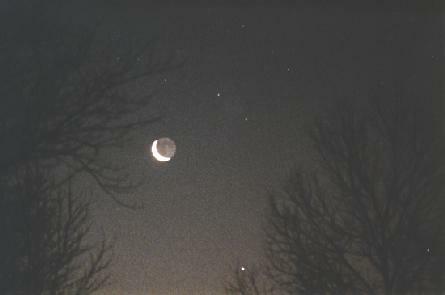 Crescent with earthlight (light reflected from Earth onto the Moon's nighttime side) and Venus. Astronomy news for the two weeks starting Friday, April 10, 2015. The next skylights will appear April 24, 2015. We begin the week with the Moon in its late waning gibbous phase. 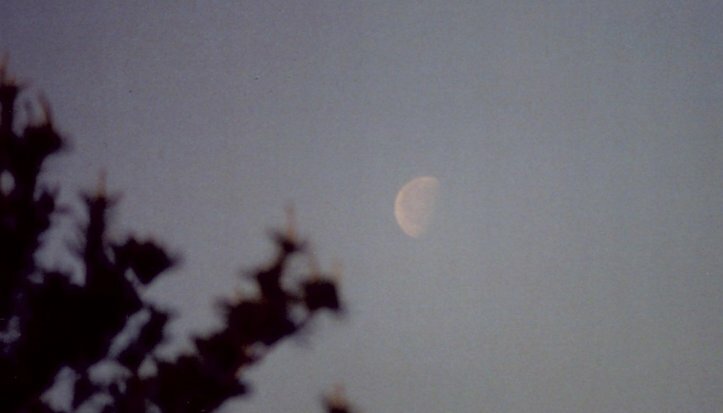 Last quarter is passed the night of Saturday April 11, after which the Moon fades as a waning crescent. With your last view of the crescent to the east the morning of Friday the 17th, the phase ends at new Moon on Saturday the 18th, after which the Moon switches to western evening skies as a waxing crescent. The twilit evening of Sunday the 19th, the ultraslim crescent will appear to the left of Mars and Mercury, while the following evening, the crescent will appear well below Venus. The best sight will be the evening of Tuesday the 21st when the growing Moon will make a nice pairing to the left of the brilliant planet, with the Hyades and Aldebaran of Taurus below. 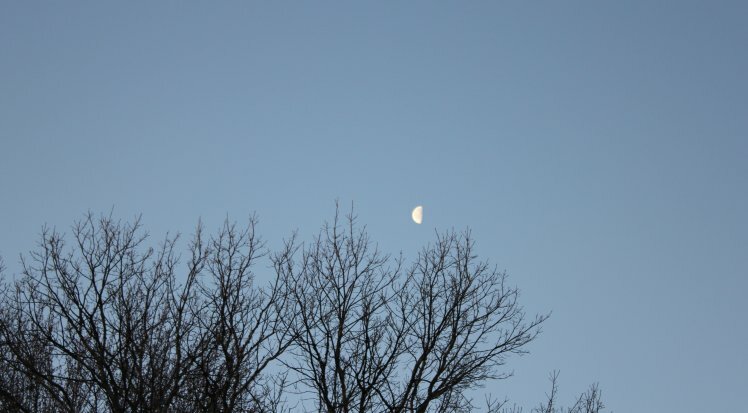 The Moon passes perigee, where it is closest to Earth, the night of Thursday the 16th. 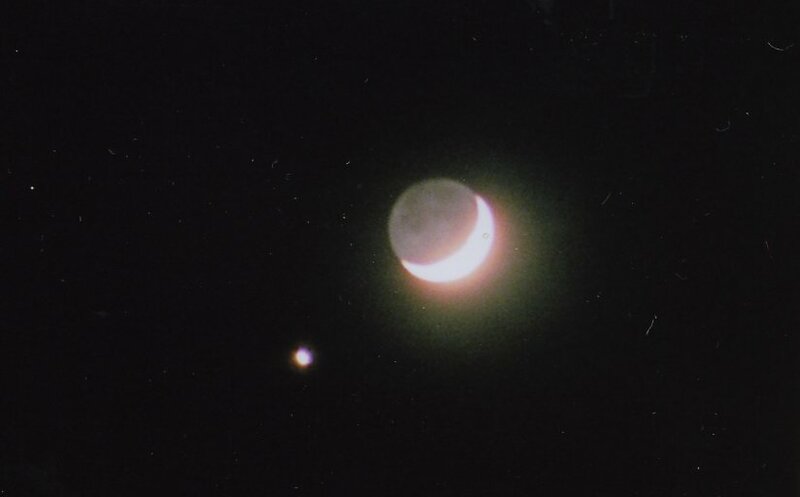 Until a couple hours past the end of twilight, western skies are completely dominated by lustrous Venus, which is behind only the Moon and Sun in celestial brightness. Look for Venus to the left of the Pleiades cluster the evening of Saturday the 11th. Just after sunset, number four in brilliance, Jupiter, still to the west of Leo's Regulus, crosses the meridian to the south, while a couple hours later, Saturn rises just north of Antares in Scorpius. Not that we will actually witness the event, but dim Pluto begins retrograde motion in Sagittarius on Friday the 17th. Among the better-known meteor showers, the Lyrids (which seem to emanate from the constellation Lyra), will reach a peak the night of Wednesday the 22nd, rather the morning of Thursday the 23rd, when Lyra is high in the sky and the Moon is out of the way. The shower typically produces 15 to 20 meteors an hour. The Lyrids are the debris of Comet Thatcher, which has a long period of 415 years. As the Sun climbs north along the ecliptic, the constellations of the "wet quarter," Capricornus (the Water Goat) to the west, Aquarius (the Water Bearer) in the middle, and Pisces (the Fishes) to the east, are being left behind to appear in morning skies. Taurus and the rest of the winter gang will soon follow to be taken over by evening twilight. Look then for the figures of summer, Lyra with Vega (as noted above), followed to the east by Cygnus, the Swan. Upside down, Cygnus becomes the Northern Cross, which rises on its side with Deneb at the top, the star representing the tail of the graceful bird. Orion's two hunting dogs, Canis Major with bright Sirius and Canis Minor with Procyon, bound toward the west, both to the south of Gemini. The constellation's two bright stars, Castor and Pollux, point downward to the roundish head of Hydra, the Water Serpent, which winds far to the southeast.